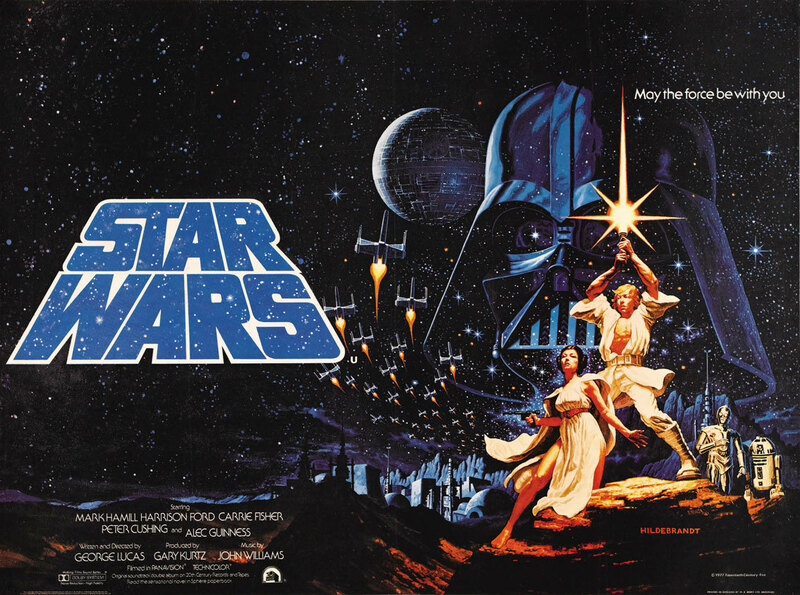 It had to happen sooner or later so, with the new ROGUE ONE: A STAR WARS STORY being released tomorrow, I figure now is a good time to take a look at one of the biggest films of the 1970’s, STAR WARS (retitled A NEW HOPE for you revisionists, but to me it’s still just STAR WARS). 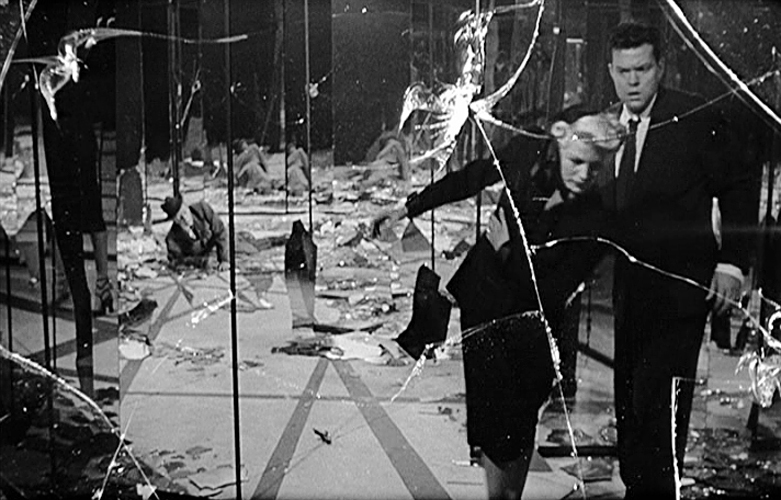 I’m pretty sure everyone reading this post is familiar with the story, so rather than rehash the plot, I’m just going to dive right into some points of interest for classic film fans. First off, the movie was originally imagined as a loving homage to serials like FLASH GORDON and BUCK ROGERS. Writer/director George Lucas originally intended to remake FLASH, but couldn’t obtain the rights, so he created his own space opera universe, cobbling bits and pieces from Edgar Rice Burroughs, Joseph Campbell, The Bible, and other sources, including the movies he grew up with and admired. There’s a definite John Ford feel to much of STAR WARS, especially THE LOST PATROL (the droids trekking across Tattoonie) and THE SEARCHERS (Luke discovering the fate of his aunt and uncle). I’d swear Ford himself was calling some of the shots, the composition is that close. Being a huge Ford fan myself, I’m always pleased when someone decides to “borrow” from the old master! Sergio Leone also gets some love, during some of the action scenes and use of close-ups. Another Italian director who doesn’t get mentioned when STAR WARS influences are cited is Antonio Margheretti, whose 60’s low-budget sci-fi lunacies sprang to mind as I rewatched the movie. And everyone should be aware of the influence Japanese director Akira Kurosawa has on this film. 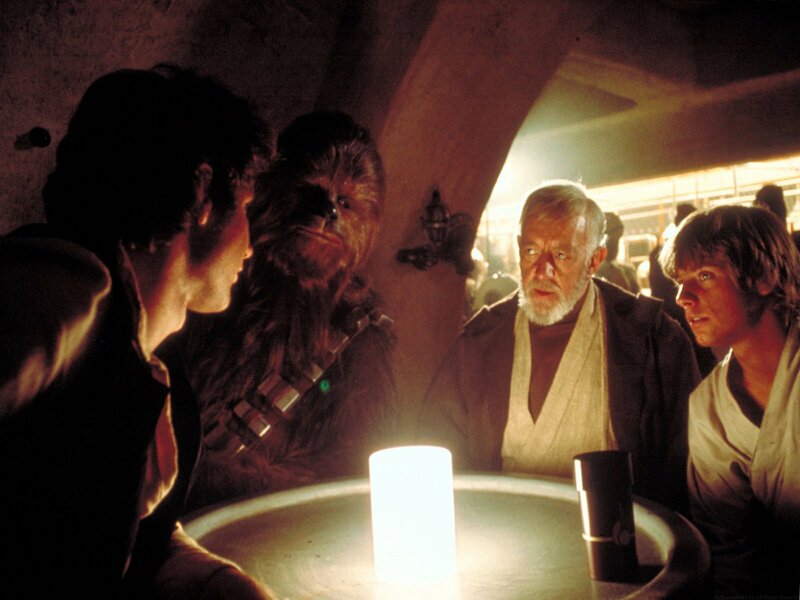 I do know the scene where a man’s arm is cut off by light sabre, and again where Han Solo is offered “Two thousand now, plus fifteen when we reach Alderaan” are direct references to Kurosawa’s classic YOJIMBO. I’ve not seen Kurosawa’s THE HIDDEN FORTRESS, so I can’t comment on the correlation between the characters in that film and the banter between CP3O and R2D2. I can say with some certainty the two loveable droids have a direct lineage to classic comedy duo Laurel and Hardy , with a dash of Abbott and Costello for good measure. CP is obviously modeled after Rotwang’s creation Maria in Fritz Lang’s METROPOLIS, while R2 resembles nothing less than a sentient vacuum cleaner! R2 does have a moment when he gets zapped by Jawas that brought to mind FORBIDDEN PLANET (which itself was a heavy influence on another space opera franchise- STAR TREK !). The evil Lord Darth Vader was so malevolent it took two actors to portray him! Well, not really, the truth is physical presence Dave Prowse’s heavily accented voice didn’t fit the character. Lucas wanted Orson Welles to provide Vader’s ominous tones, but went instead with James Earl Jones, who does a superb job. Prowse had once played the Frankenstein Monster alongside Peter Cushing in FRANKENSTEIN AND THE MONSTER FROM HELL, and the two are reunited here as the great Mr. Cushing plays equally evil Gran Moff Tarkin. I couldn’t help but wonder what the film would’ve been like if Lucas had chosen Christopher Lee to portray Vader, and gave us fans another chance to watch Hammer Film’s two greatest icons together! The light sabre duel between Vader and Obi-Wan Kenobi (Sir Alec Guinness) is no doubt inspired by the grand final battle between Errol Flynn and Basil Rathbone in THE ADVENTURES OF ROBIN HOOD . Sir Alec himself thought the movie was a lot of “rubbish”, but lends a dignified presence to the proceedings. Some of the films he made with British director David Lean, mainly LAWRENCE OF ARABIA, cast a large shadow over the look of STAR WARS. War films as a whole play a part in influencing the movie, as Cinematographer Gilbert Taylor was behind the camera for THE DAM BUSTERS, the attack on the Death Star was pretty much lifted from 633 SQUADRON, and THE GUNS OF NAVARONE has also been cited as an influence. I guess I’m among the minority as not going crazy every new film or being a huge fan. The original, as you’ve done a fine job in going behind the scenes, is good, and Empire is great. I don’t care for Jedi after the beginning, and of the next three saw the first one and hated it. It could be just me, and I’m fine with that, although I would like to watch the original trilogy soon and perhaps review them myself. Again, great job of giving us all a different way to view the scenes and characters. Thanks, Drew. As for me, I’ll stick with the original trilogy… I’ve never watched any of the “prequels”! Dear Mr. Loggins; Your wonderful, thoughtful and dead-bang historically accurate second look at Star Wars and the influences that Lucas employed has made my day. Your references to some of the early influences – that were flawed and homogenized by Hollywood, but still retained an excellent story core – such as the Flash Gordon serials and Forbidden Planet, really hit home. As a long-time fan of great films, who takes great pride in having been raised in the Island City of the Tube (original THX1138 reference), I salute you. We are seeing Rogue One on Saturday, in 3-D. My boys can’t wait! Have fun out there this weekend. I didn’t like the last episode of Star Wars but I will wait to watch this instalment on iTunes or Amazon Prime so I can throw popcorn at the screen.